📥 Why You Need To Repair Corrupted WordPress Database Tables? 📥 How to optimize and repair corrupted WordPress databases? How to check MySQL databases tables using phpMyAdmin? 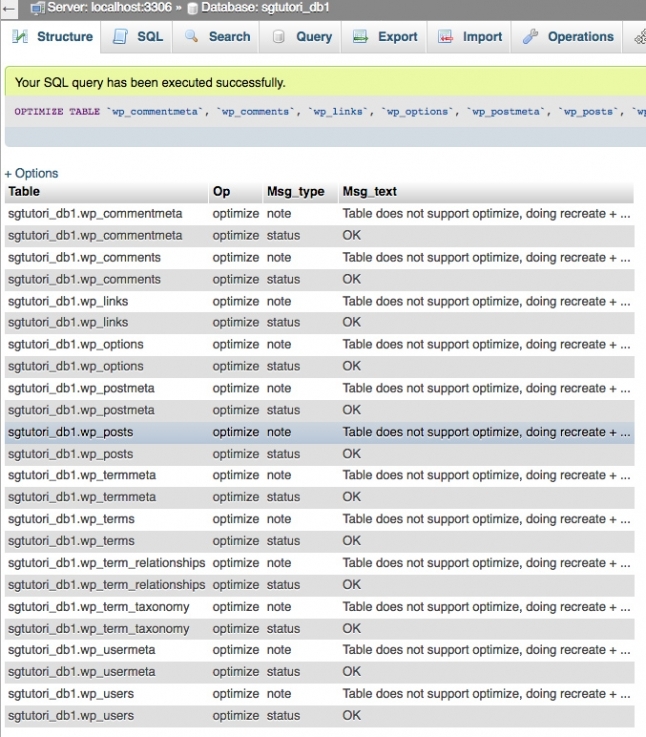 How to repair MySQL databases using phpMyAdmin tables? How to optimize database tables? Database tables tend to crash quite frequently. However, optimizing & repairing them is an effective solution through which you can put an end to such a situation. 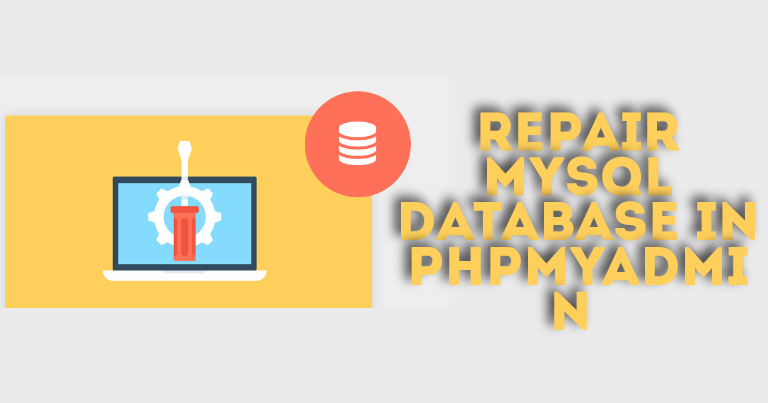 Here is a detailed guide containing all the reasons behind this issue, benefits of doing it, how you can fix the issue (automatically or manually), and How to Fix Corrupted WordPress Database & repair MySQL database using phpMyAdmin. 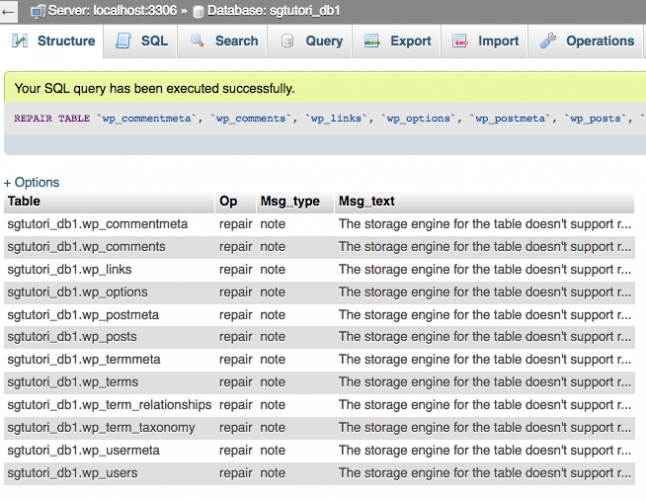 Let us dig into how you can repair wordpress database. It does not matter what the reasons are, there are methods through which your files or database can be fixed. Repairing and optimizing WordPress database will give a boost to both the speed and performance of your website, this will eventually improve the overall experience of the users. All this will create a positive impression of your website being responsive for your users. Removal of all the unnecessary data and tables will make your site more responsive and organized. The best part is that is that this will help in having more space in your database to memory which can be used to carry out various other productive tasks. Since, all the unnecessary data is removed, hence it will certainly help in easy management of the database and contributing to a rewarding experience as well. Every single query run through your database will fetch the data more quickly and also boost the overall response time of your website. Restoring your website from a working backup of your wordpress site is one of the easiest ways to fix the issue of database or broken file. In case, you are not having a backup that you can restore, then there are other ways you can turn to. Remember, before you try out other methods, you need to take backup of wordpress site. Even though it’s broken, things could get out of hands, so it is better to have something than to lose everything. Once you have taken the backup of your site using any of the above-discussed plugins, you are all set to fix your site. – This particular plugin is made in a manner that it allows you to optimize database, repair database, backup database, restore the database, delete backup database, run selected queries, etc. WP-content folder will automatically have a folder by the name of backup-db which will be created by the script, provided that the folder is writable. In case no folder is created, then you can create one and make sure that it is writable. This plugin is made to make significant improvements to the fundamental features inside your WordPress installation. This also helps in keeping your database less cluttered. This is an ideal choice for all those who are looking to have smooth database management and those who have to clean their WordPress for meta, misplaced categories, users, etc. CleanFix epitomizes numerous functions (offered as single plugins) and makes them easily available for easy and hassle-free website management. Uncluttered and simple user interface empowers you to enable or disable all the features, you like to have on board, and without wasting your time as well. 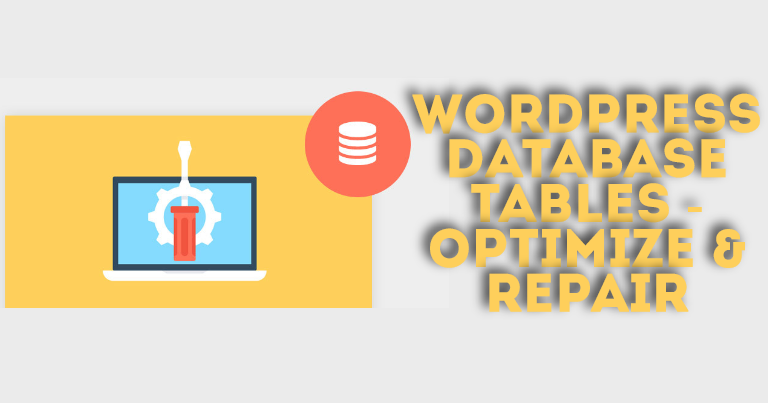 An effective tool for automatically repairing and optimize your WordPress database table so that it runs at maximum efficiency. Once you are done taking the backup, install WP-optimize plugin. 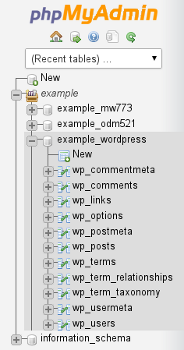 When the plugin is activated, your WordPress admin bar will have a new menu item and it will be labeled as WP-Optimize. The moment you click on it, it will take you the setting page of the plugin. The plugin will carry out a number of operations on your database. Make sure have a closer look at all the items you actually wish to run and uncheck all the items you don’t. All the items marked in red needs thorough database operations. If you come across any interruption, during the process, then it may end up corrupting the data. You need to click on ‘Run on all selected items’ (towards the top) once you have selected the items. This will trigger the plugin to initiate optimizing your WordPress Database and you will be able to have a look at the progress. Make space: Removes these unnecessary post revisions, It also cleans up your comments table, removing all the spam and un-approved comments that have built up with a single click. Take control: Reports on exactly which of your database tables have overhead and wasted space, giving you the insight, control and power to keep your website neat, fast and efficient. When you have added the above-mentioned line, go to the database repair page – http://your-site.com/wp-admin/maint/repair.php. In case, you have SSL certificate installed, you need to visit https://your-site.com/wp-admin/maint/repair.php. Make sure you have used your site’s name where site.com has been mentioned. To view this page, it is not mandatory to be logged in. You need to hit the button when you visit the link or optimize the database while you carry out the process of repair by hitting the button of Repair and Optimize Database. The moment you are done with the process, your site will be fixed and running. You might not be able to watch the images if you have recently installed an SSL certificate to your website. But this issue can be easily fixed. You have to replace the image links to have https prefix. For various other problems, you just need to replace the problem file with a fresh copy to fix them. With the help of FTP, you will have easy access to your site and use fresh copies in place of key WordPress files. Once you have the uncompressed zip file, new files can be easily transferred to your website. You don’t have to make any changes to /wp-content/ or lose the media files which you have uploaded to your website. This can also be tried with the installed themes and plugins. Here, the only difference will be that you just need to download a fresh copy of plugin and theme files in place of downloading a new copy of WordPress. Before you start off with the process to optimize and repair MySQL databases using phpMyAdmin, make sure you take the backup of your database. This will refresh the page and you will have easy access to the summary of the table, that may have become corrupted. First and foremost, you need to log into your cPanel. Hit the icon of phpMyAdmin. Make a selection of the database you are working on. You just need to click on it towards the left menu. Towards the right side of the page, tables are listed. Hit ‘Check All’ and choose ‘Repair Table’ from the dropdown menu. This will refresh the page and you will have easy access to the summary of the tables, that was repaired. Here, we are now going to focus on how we can optimize database tables. But, before we go ahead, knowing the reason why you should optimize your WordPress database can really come handy. If you are using WordPress for quite some time now, then you must be having purposeless data in your database such as spam comments, post revisions stuff like that. Well, all this end up increasing the size of your WordPress. This will mean that WordPress backups will take extra space and the duration to restore will also increase. When you get rid of unwanted data, the size of WordPress database tends to reduce. The positive side of this is that you can have swift backups, enhanced performance of your database and hassle-free restoration. 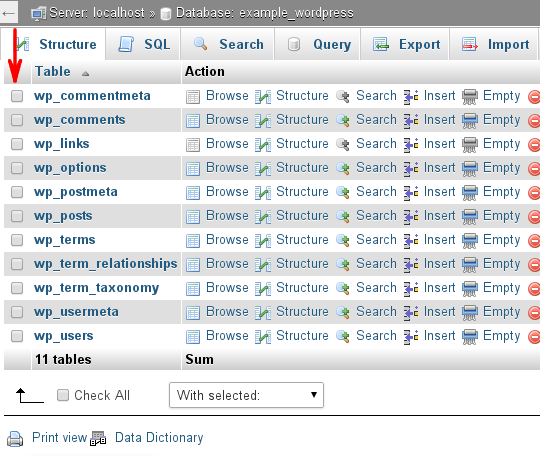 >> Select all of the tables that you want optimized by ticking the check-box next to their name. >> From With Selected >> From drop down menu choose Optimize table. The optimization will be performed automatically and a new page will open that shows the result of the operation. Since the process of optimizing will comprise of your WordPress database, it will be a smart move to create a backup of entire WordPress. If none of the above solutions work for you, then the best thing to do is to restore your database from the last available backup. If you wish to not handle this by yourself, then get in touch and we can repair your WordPress database for you. 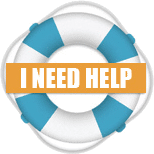 WP Hacked Help is a subscription-based security, backup & WordPress repair service. We perform backup and restore WordPress websites seamlessly and without much effort at all. Additionally, we make sure your website is protected from all types of WordPress vulnerabilities. 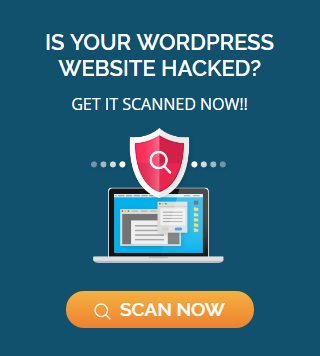 and hacks such as WordPress XSS Attack , Remove Malware From WordPress Site , Web Shell PHP Exploit , WordPress Arbitrary File Deletion Vulnerability , WordPress Pharma Hack , Error Establishing a Database Connection ,eval(base64_decode()) Hack, Japanese Keywords Hack etc………..